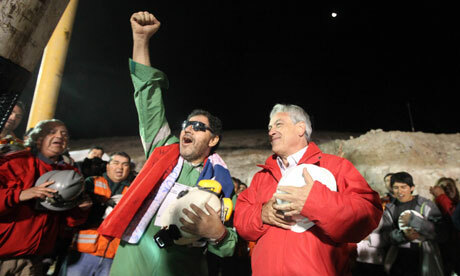 We’ve all seen the wonderful scenes of joy and jubilation as the Chilean miners were brought to the surface after their 70 day ordeal trapped 700m underground. Like many, I watched with a big smile on my face as the miners reached the surface. One thought that jumped into my head uninvited was what number I would like to have gone in the rescue sequence; definitely not first, thirteenth or last. Number three would be about the perfect position, one is the guinea pig, two proves getting the first one out wasn’t a bit of luck and three gets out nice and early. Having resolved this dilemma I watched one of the miners carefully as he stepped out of the capsule that had brought him successfully to the surface. Considering what he had been through, an unimaginably traumatic and physically demanding experience that is difficult for us surface dwellers to fully comprehend, he looked remarkably perky. Well groomed, clean-shaven, beaming smile, saluting the crowd, hugging friends, family and of course the Chilean President. 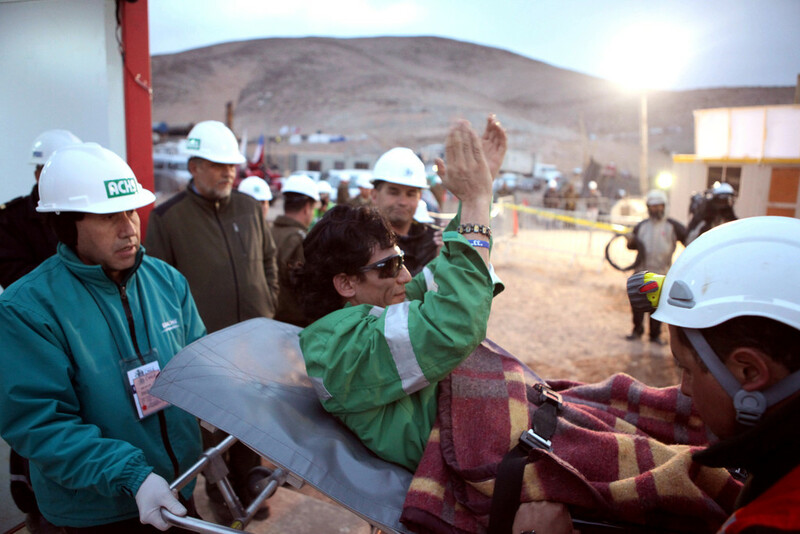 After about five minutes of this he suddenly lay down on a stretcher and was carted off still waving furiously to the assembled crowd and media audience. I really didn’t get that bit, it was like a rewind of a football match where a player rolls around in agony and then when the stretcher appears miraculously bounces back to his feet. Is it all a conspiracy? With this image lingering my thoughts switched to the horrid leader of Iran, Mahmoud Ahmadinejad. Having tried to re-write history by denying the holocaust he has announced that the Twin Towers attack was orchestrated by President Bush. Now I’m not a fan of Bush in any way shape or form and I have heard these crazy claims before, but ultimately how can people be so stupid to actually believe this sort of stuff. If Bush had ordered the attack on the World Trade Centre how many people would have been involved? Forget whistle blowing, one of them would have started the vuvuzela craze well before the World Cup in South Africa. Now all I am waiting for is someone to associate the apparent wellness of the miners with a conspiracy theory that the Chilean President ordered the whole episode to boost his popularity! Similarly the Americans never did get to the moon and J.F.K was killed by the FBI who later went on to take out Marilyn Munroe and Jimi Hendrix. Shame MI6 never had time to find the weapons of mass destruction and get Tony Blair off the hook. Which brings me neatly to Spooks, a UK TV series that dreams up doomsday scenarios with danger averted by the brilliance of the UK intelligence service despite the best efforts of the Americans, Russians and Chinese to out-intelligence them. I watched a recent episode from the new series and there were some seriously bad people trying to out-bad each other. In amongst a cast of naughty Nigerians and unpleasant Ukrainians was an English super baddy who was double-crossing everyone. To catch all of the other baddies MI6 did a deal with the English baddy (keep up at the back) who ended up requesting a first class flight and new identity in Dubai! The Commonwealth Games went off rather well I thought and come the end everyone was happy including the media who had a bad news story to play with for a few weeks during the build up. My prize to the most colourful character goes to Australian diver Matthew Mitcham. Not only was he one of the few openly gay athletes at the Games, and entirely comfortable in his position as role model (“I want to do the best job I can because I believe it is important to have someone who is happy to be themselves”) but he had a back-story to make nonsense of the stereotype of the one-dimensional professional sportsman. Mitcham once paid off his debts by working as a clown, diving from a tower into a small tank to amuse children. Having being called a clown a few times in my life, respect goes to Matthew for walking the walk. Hopefully more people will now dress up as clowns starting with the marketing team at GAP who to be fair at least have the good sense to read my blog. You may remember I dismissed GAP’s new logo in my last post and it obviously did the trick – they have binned it. For a lesson in spin take a look at the linked article, apparently it’s all about listening to your customers. In my last post I also expressed that I wasn’t a big fan of the hugely popular Old Spice ads. Click here for Sesame Street’s excellent version, much better and it will make you chuckle. As my price watch is proving a big hit with at least one of my readers (thank you Paddy McGrath) my latest revelation is the price of a Nikon SLR, over AED 3,000 (on offer) in Sharaf DG, £460 on Amazon! The reverse side of the coin is Air Miles 50% offer in Damas Pavilion, Bur Juman. Just flash your Air Miles card and get 50% off plus Air Miles – use your HSBC credit card and get even more Air Miles. Triple whammy, this offer was forwarded to me by a trigger happy Mrs P who managed to get her blow in seconds before the e-mail arrived from Air Miles. One subject I’ve neglected recently is what I’m listening to, notably a brilliant album from Biffy Cyro that was released at the end of 2009 and a spanking brand new album from the Klaxons. This leads me neatly to my top 5s via an article I read in The Guardian reporting that Weezer have been offered $6 million by their fans to break up on the basis that after a promising start they have resorted to churning out rubbish. Top five bands/artists I would pay lots for them to break up (Oasis just beat me to the punch). Which formerly great artist(s) should be ejected from the recording studio forever? For this or to pitch in about any other subject use the comments box below. With the rain tipping down in South Wales ruining my 13 hour festival of viewing from my reserved spot on the sofa (trespassers risked the death penalty) and the US teams’ waterproofs sprouting leaks (the only thing that cheered me up) I’ve decided to break the habit of a blog time and talk about advertising. Before I do however, am I the only person who thought McIlroy was right to go for the 18th green in two on the final day (of the Ryder Cup)? Go on my son you’re 21; I watch golf to see people do things I can’t. 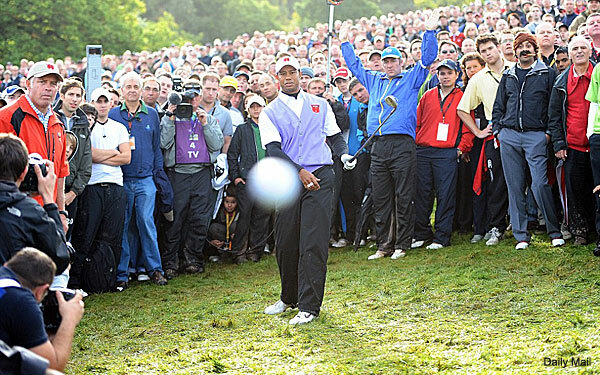 Talking of things I can’t do (either) my favourite shot of the entire tournament was when Tiger duffed his chip from the right of the 18th green on day two and a half. He managed to hit a photographer square-on which resulted in this stunning photograph. Back to advertising, my attention has been drawn to a Sun & Sand jingle that goes something like ‘The largest multi-gender sports and leisure retailer in the Middle East’. My issue is with the word multi, I thought there were only two genders but maybe they are going after the pink pound that used to be the reserve of Jules Bar at the Meridien Dubai Hotel. I recall many years ago going to Dubliners and being redirected by a certain Marek Sheridan who insisted I try Jules Bar as the people in there are really friendly. He was right for all of the wrong reasons. My wife, aka Sally2Hats, sent me the Egyptian ads for a brand of cheese called Panda. At first I thought they were for the Panda supermarket chain and I vowed never to go there just in case my kids bumped into the star of the commercial, a seriously scary panda that shocks and awes anyone who dares not to be eating his brand of cheese. The scary tactic, if you don’t eat Panda cheese you’ll end up between two slices of bread, challenged Saatchi and Saatchi’s lovemark philosophy (to succeed brands need to be loved) e.g. McDonald’s – I’m lovin’ it. Take a look at the ads and hope you never bump into Mr Panda. To be absolutely fair I think the Panda ads have been and will continue to be very successful as they have got people talking about the brand and there is the formula there to create a cult. They have also developed a campaign which can run and run and be exploited through every communication vehicle – the sampling should be fun! There have been over a million views of this ad on You Tube which is pretty damn impressive. Even more impressive is 21 million+ views the Old Spice ads have ramped up. I think the ad is OK but it’s not that great and the humour seems pretty obvious to me. Finally for a bit of nostalgia who can forget the old Old Spice ads doused in an uplifting burst of Carmina Burana. A bit of controversy and lively debate was caused this week when Gap unveiled its new logo. Before adding my two penneth worth I have to admit I’m the person who likes the London Olympics logo. The Daily Mail hated it which pretty much cemented my opinion even before I saw it. Then I was reminded of the Flinstones – double whammy. When you compare London 2012 with what has gone before I think most peoples’ views would soften. Through the ages Olympic logos have featured clichés of the host city, obvious stuff and as such un-talked about and uninspired. However Gap has seriously messed up proving all publicity is not good publicity, their new logo is on the right! Last up on brands comes a great new product from Marmite, a product built around the simple insight that people either love or hate it. I’m a hater but I wish I loved it. Now they have launched a Marmite chocolate bar and it sounds delicious. Having started on advertising and promised to keep to the script, this classic rugby league, home-spun philosophy quote popped up and my resolve dissolved. “It’s a bit like watching your mother-in-law drive over a cliff in your brand new car. There are mixed emotions” – Steve McNamara after Leeds had snatched a draw against his Bradford team at Headingly. Want to pick a bone with me? Feel free in the comments below.